Got dandelions? Most of us do, so why not make something delicious with them, like this dandelion bread? 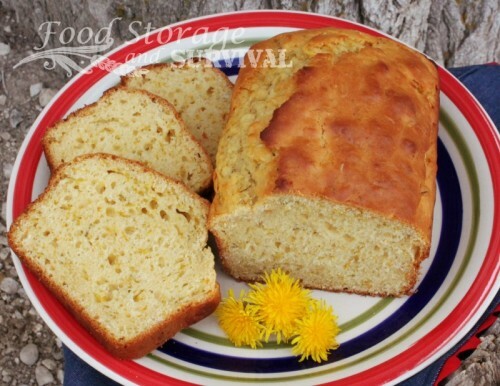 A simple quick bread infused with dandelion petals sure to brighten any spring day. First, gather your dandelions. You want to gather from an area that has not been sprayed with herbicide, like your own yard. You only need the yellow flower, so this is an easy job for the children! You’ll want a bunch. Wash your flowers and separate the petals from the green. This was admittedly a bit tedious. After a few I got it down to a sort of a system. You can just cut the bottom of the flower off and have a bit of green in your bread if you want this to go faster. 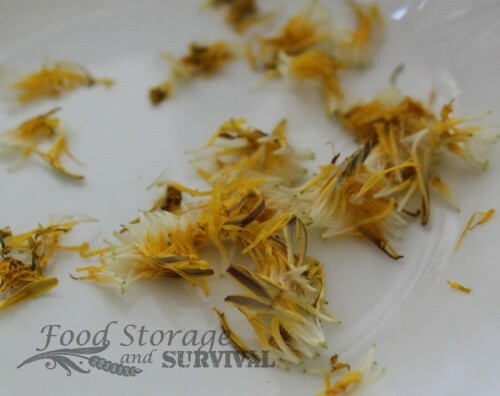 Once you have between 1 1/2 to 2 cups of petals, gather your other ingredients and get baking! 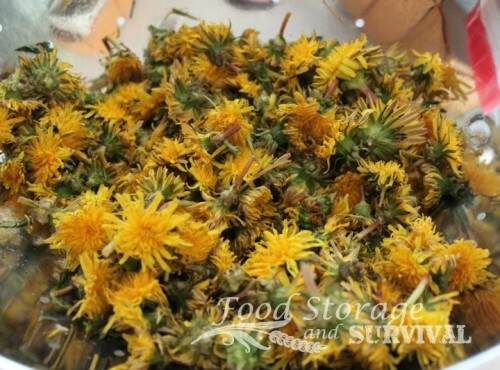 Preheat oven to 400 degrees F. Combine dry ingredients, including dandelion petals, in large bowl. Get a little helper to help stir. In separate bowl mix milk, beaten eggs, honey and vegetable oil. Add to dry ingredients and mix well. Get a second helper if you have one and let them both stir. 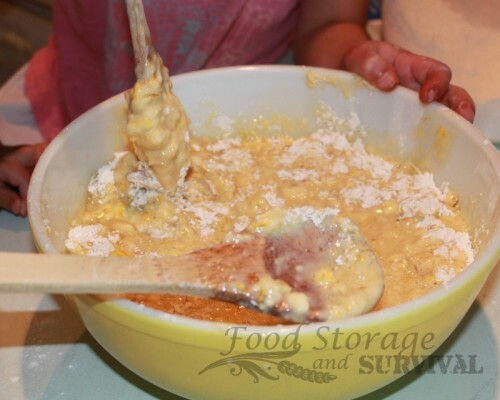 Pour batter into two greased bread pans. Bake for 20 – 25 minutes. Lower temperature to 350 degrees and continue baking another 20 minutes. Thanks to Walnut Acres for the original recipe. This bread is not super sweet and has a really nice moist spongy texture. Perfect with butter and honey or just by itself! Enjoy! This really looks good. Can I freeze the pedals to use later too? You probably could. It would be worth an experiment on it for sure. Thanks for your comment! We hve frozen the flower part and successfully made dandelion jelly. Are you using 8 x 4″ or 9 x 5″ bread pans? It does make a difference in baking time. 8×4 bread pans. Thanks for asking! Thanks so much for the info on pan size. I made two batches this weekend. Wish I knew how to preserve the flowers so I could use them later. Just took mine out of the oven. I picked and cleaned the flowers yesterday and baked the bread today. Gotta sy I LOVE it!!!! I’m going to research how to preserve the dandelions for use in the winter months! I can’t believe how good this bread is… It may be a tedious job pulling off the petals, but so worth it in the long run… I collected an ice cream pail full. Enough to make the two loaves of bread and a pint of Jam… With enough petals left for 2 more loaves and another jar of jam.. which I put into a freezer bag and put into the freezer for making at a later date.. Thank you Angela for this great recipe.. I wonder if this would help with dandelion allergies. I know local honey helps me with my seasonal allergies, I wonder if this is the same concept or if I should just not try it due to allergies? I’m so excited to make this today, I’ve already made the jelly! One suggestion, on the printable recipe, could it be one page with maybe one photo? It’s a big waste of paper and ink for full color pictures and four pages when all I need is the recipe. I love what you’re doing and can’t wait to try this! 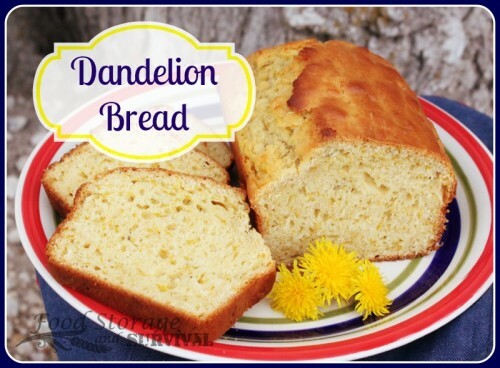 My daughter keeps talking about making the dandelion bread today, too. what a brilliant and so very healthy idea! My only recommendation is to replace white flour with whole wheat flour. 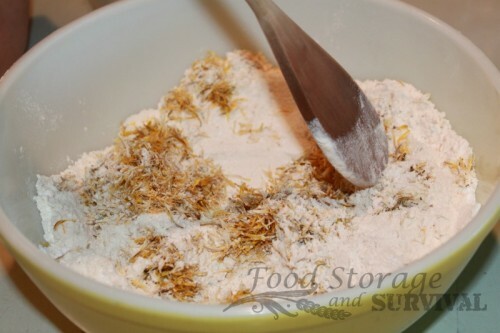 I used part whole-wheat flour, but it wasn’t very pretty – you could barely see the yellow of the dandelion blossoms.